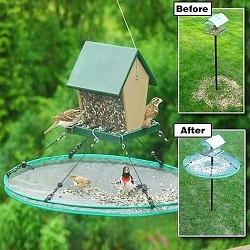 Geohaus Caged Feeder... Style with Function! 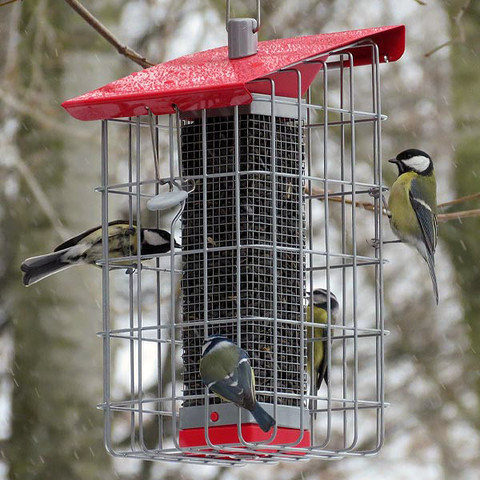 Stylish and beautifully made, the Geohaus is designed to attract a wide variety of birds year round! 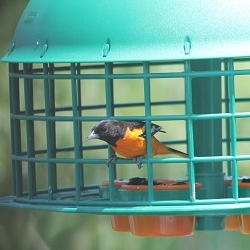 Feeder's outer cage allows smaller birds to feed, but keeps squirrels, larger birds, and predators out! It's also highly functional with a clever in-built hopper. No more mess - filling the Geohaus is a breeze! 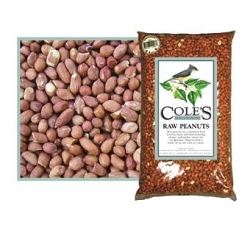 Add a modern hint to your classic hobby with the Nuttery Geohaus Caged Peanut and Sunflower Seed Feeder. 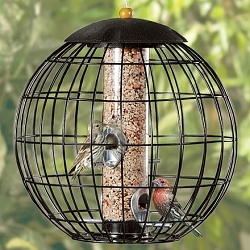 The bright red roof, funnel, and base on this item mesh with its square shape, for a dynamic addition to your bird garden. 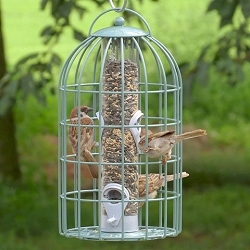 An 8.5” tall, mesh column occupies the center of this unit, easily holding 1.7 lbs. 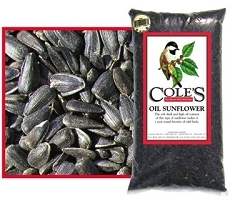 of shelled peanuts, peanuts in the shell, or sunflower seeds. 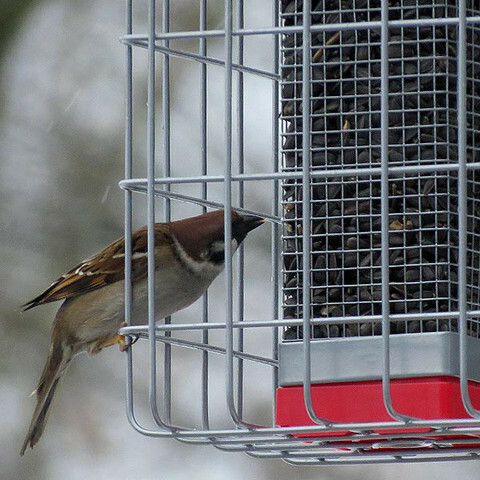 Small birds can fly through the 2.25” tall and 1.25” wide openings of the exterior cage to reach their treat, and pull the seed through the 0.25” square mesh of the reservoir. 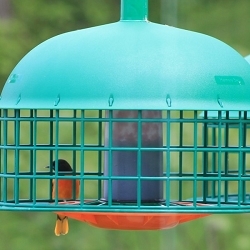 A generous, red roof protects the feed from rain, while a baffle on the base of the tube helps it empty fully. 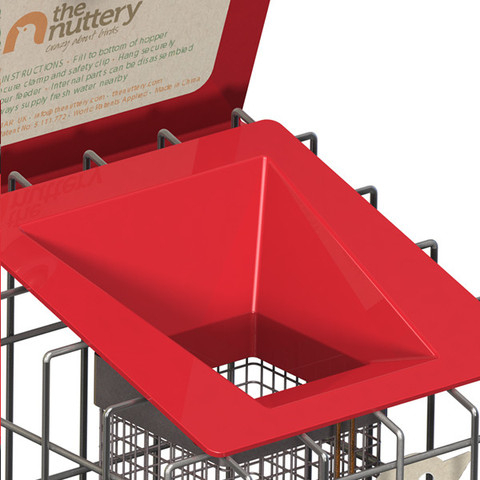 A bold red, plastic funnel at the top of the seed tube ensures tidy and quick filling, and the unit disassembles in moments for thorough cleaning. 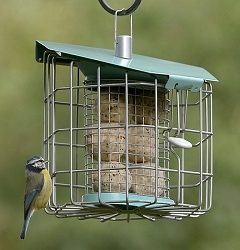 A large latch connects to the roof, helping it remain closed and further deterring squirrels, while the all metal lid and frame offer even more protection. 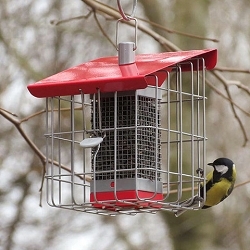 A sturdy hook at the top of the roof allows you to hang this feeder from a bracket easily. 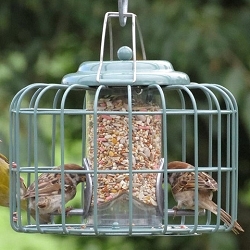 Blend contemporary shape with timeless nature using the Geohaus Caged Peanut and Sunflower Seed Feeder.